Cockroaches can hold their breath for half an hour and go without food for a month. They can go for two whole weeks without water. A cockroach can take up to a week to die after its head has been cut off. This is because its brain is not located all in its head. Their six little legs can run 3mph. They use their feet to taste. Cockroaches can cause allergic reactions and trigger asthma attacks. This is due to the fact that their skin and waste are allergens. If you see one roach, chances are extremely high that there are man, many more in the area. Roaches do not like to travel alone. Cockroaches prefer to live in warm climates They are nocturnal and like damp places. Cockroaches will eat almost anything. They are scavengers and are omnivorous. They will even eat their own kind. Poison can be used to kill roaches. If one roach eats a poisonous substance, any roach that then eats it will also become poisoned. Cockroaches carry diseases. These nasty insects have been known to transport viruses on their bodies and legs. Among the known diseases that they can carry are, dysentery, typhoid, cholera, leprosy and tuberculosis. There are both male and female roaches. They reproduce sexually. The young are contained in a special sac which is carried by the mother. This sac is called an oothcae. The oothcae can be either internal or external. If the sac is internal the young are born live. The young roaches are called nymphs. They actually shed their exoskeletons in order to grow, They will keep doing this until they reach their adult size. Depending on the variety of roach this molting may occur 13 or more times. It takes about a year for a cockroach to mature. 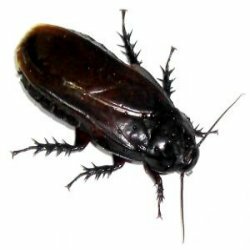 The word cockroach comes from the Spanish word cucaracha. It translates to mean ‘crazy bug”. The Mexican song La Cucaracha is an old Spanish song dating back to the Mexican Revolution. There are numerous different verses. This entry was posted in Insect Trivia and tagged cockroach information, cockroach information facts, Cockroach Trivia, Cockroach Trivia facts, facts about roaches, quick Cockroach facts, roach trivia, roach trivia facts by Jane. Bookmark the permalink.